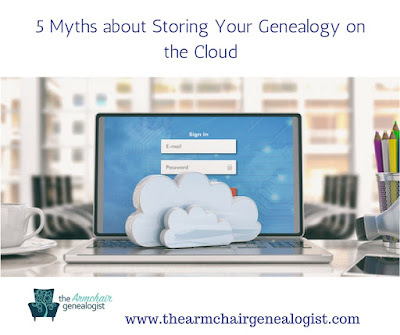 Does the sound of saving your genealogy research on the cloud scare you? You wouldn’t be alone. 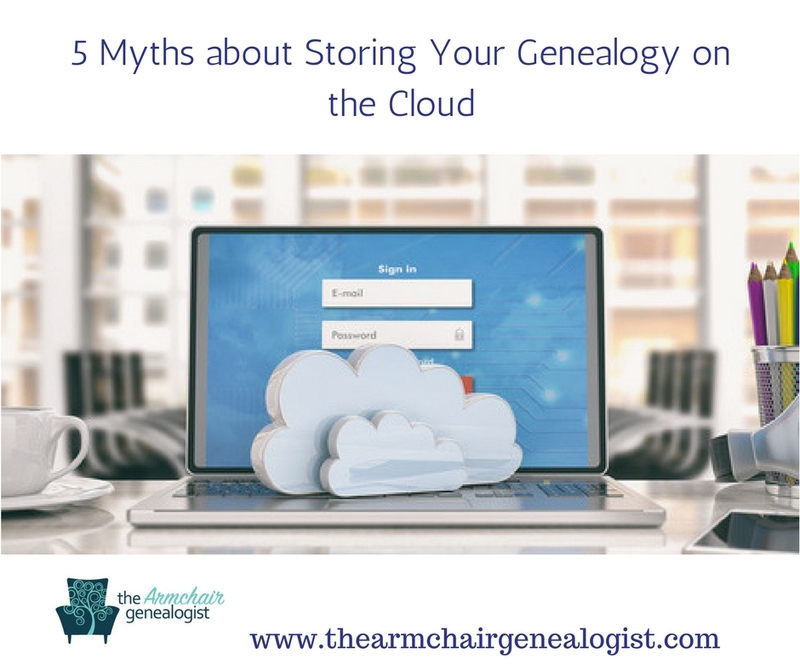 Many are still reluctant to use cloud storage for their family history research. But, we’ve only begun to see the edge of the waters for cloud storage and services. So, for those of you who may be dragging your feet, it’s time to talk. First, let’s consider where things are headed. The Millennial Generation doesn't print their photos; they store them on their phones and computers. My daughter pointed out that her children and grandchildren won’t be rummaging through boxes or photo albums. Instead, her descendants will be accessing her photos on the cloud. Do you want your children or your grandchildren to take over your family history research? You have a much better shot at it if it’s on the cloud in some organized fashion. 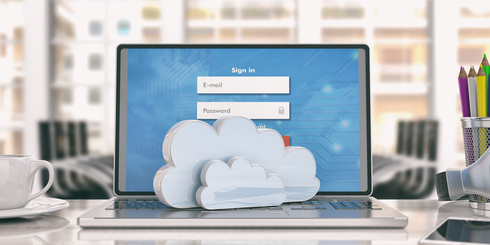 Perhaps there are few myths out there about cloud storage that are holding your back. Let's take a few minutes to beat down any misunderstandings you may have about cloud storage. If I say that I store my family history pictures on the cloud, many think that means on the Internet. Not so! A cloud is a network of remote servers that are only accessible using the Internet. The Internet is one giant global network of connections. There are hundreds of thousands of clouds around the world; they are not one single entity. So when we say our family history is stored on the cloud, we mean on a specific remote server. Note that there can be public clouds and private clouds. A public cloud is something like Dropbox, a service that’s accessible by anyone from anywhere as long as you create an account. A private cloud is a server that is dedicated to a specific company for their files. Many think cloud storage is nothing more than online data storage like Dropbox or OneDrive. But there are cloud services as well. Google Docs is a cloud service that allows you to create and edit a document on Google’s servers. Your browser is the window to the action. This is called cloud computing. There are many cloud storage and services you might already be using. Nothing happens on your computer; it all happens on their servers. Myth 3: Cloud Storage is Insecure. Hackers are everywhere, and for them, everything is fair game, including cloud storage. But the difference between cloud storage and your computer is the level of security. Cloud companies use some of the best security experts to protect their customers. Cloud servers are better protected than your computer will ever be. Otherwise, they would be out of business. Security is essential to the survival of the cloud storage industry. Now, just because you store your family history on the cloud doesn’t mean you shouldn’t have a backup of your data somewhere else. When you decide to use cloud storage, it usually means some sort of fee or subscription. And while most cloud services offer free plans to get you started, these free plans are often limited. Cloud storage may seem expensive, but the alternative is too buy costly software programs and backup drives. By the time you shell out for the software, upgrades and backup drives you might be ahead with a yearly subscription. Myself, I like the idea of paying one annual subscription and know I have secure cloud storage available to me when I need it from wherever I need it. It becomes a part of protecting my family history and my business. There are still plenty of people who think the cloud is a gimmick that will soon die. The cloud is here to stay. Industries are transitioning every day to cloud storage and services. There is still so much more to come. If you haven’t enlisted the use of cloud storage and services, give it a try. Ease your way into it. I recommend Evernote, OneDrive or Dropbox as starting points to getting yourself acquainted with storing your research on the cloud.